Ok, so maybe beer and ipods are the same thing. No, it’s probably just hipster fodder. 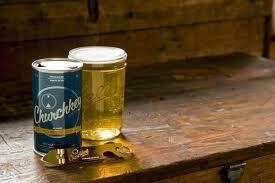 Churchkey Beer Can Co., a retro flat top beer can company that incidentally puts Pilsner in the cans as well, is blowing up the scene in Silicon Valley, the Atlantic reports (So screw you MGD punch top!). Already hate it? Well here’s more: It’s co-founded by Entourage star Adrian Grenier! Below is their video, explaining why the beer is apparently better when you need a tool to open (or a rock if you’re desperate). That’s right, it’s not about working hard for the money used to buy the beer, it’s about working hard to open the beer – or being insanely frustrated when you can’t find a churchkey tool a-la can’t find a bottle opener. While they do manage to mention the beer once or twice, it’s obviously all about the can. Retro flat top cans? Whats next? Painted bottles and casks? oh wait. I also see people making references to Don Draper, but this is more reminiscent of Red from that 70s Show to me. Either way, I think we will all need to accept that, as we have with Apple, if we want to be cool, we will all need to drink from flat top cans.